This very special award was recently developed by Dessa Rae of Dessa Rae Art Dolls. 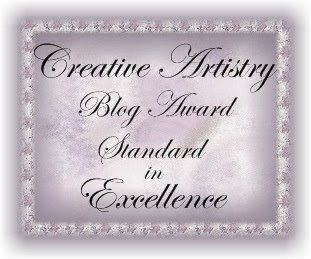 I love what it stands for and when I first read Dessa's blog about the creation of this award, I thought - this is brilliant and really does exemplify everything that is good about blogging. As the first recipient of the award, Dessa presented it to Joanna Thomas of Joanna Thomas Art Dolls. What a perfect person to receive this I thought! To my surprise and delight, Joanna has passed the award on to me. I am honoured and thrilled. When I started blogging just before Christmas 2008, I was very wary. I was sure I would not have anything to say, and felt that it may be yet another project that I start, and lose interest in very quickly. I started visiting other blogs, first of people I knew (or knew of), and then explored some of the people that would post on those blogs. Getting up nerve, I started leaving responses of my own, and following some of the blogs. Within a couple of days, my interest was firmly peaked, I had made some new friends, and I was completely enchanted by the world of blogging. I never imagined the brand new world that blogging has opened up for me. Each day, I find inspiration, information, humour, friendship...something to brighten my day, just through blogging. Joanna, thank you so much for this award, it is so special to me and I am truly honoured. When Dessa created this award the one stipulation was for the recipient to pass the award onto another blogger who was felt to be deserving of it. Marilyn Radzat of As Seen Through My Eyes. Marilyn is one of the most talented artists I know of, and one of the most beautiful people that I have the pleasure of "knowing". (one of these days, I hope to meet Marilyn in 'real life'). I've known Marilyn for approx. 10 years now, and consider her not only a friend, but a mentor. (When I started creating dolls, I wanted to be just like Marilyn LOL) This extremely talented and creative woman is also one of the most selfless and giving artists that I know of. She is always a source of inspiration and her blog constantly reflects this. It is a pure joy to visit and as with her incredible pieces of art, one is transported to a magical place. So Marilyn....this one is for you! Wow...Sue, thank you so much! That you could only choose one person to receive this award and you chose me...well, it means a lot to me. It's rare in this world that we get to know that what we say, or what we do, or who we are, actually touches another...so this is a really beautiful gift that you offer to me and I will tuck it into my heart and will carry it with me always. Thank you, Sue. Yes, some day we will meet in person....and until then, we can just let our spirits dance together. Congratulations - both you and Marilyn are certainly deserving of this particular award! Sue, Marilyn sounds like an amazing person. How lovely. By the way bout Julian, no matter what happens he has been noticed now and I think will have a great life ahead of him. Thanks for keeping me posted. I am hearing this only from you so please don't quite updating me. You both deserve this honor for the beautiful work you create. Congrats Sue! No one deserves it more. You know why I'm here don't you? Sounds good Sue, I will check it out.